Lena Brockmeier, Roland Buckingham-Hsiao, Maggie Hsiao, Alice Ling, Chrissy Philp, Emma Philp, Hannah Stevenson and Bryony Tilsley. 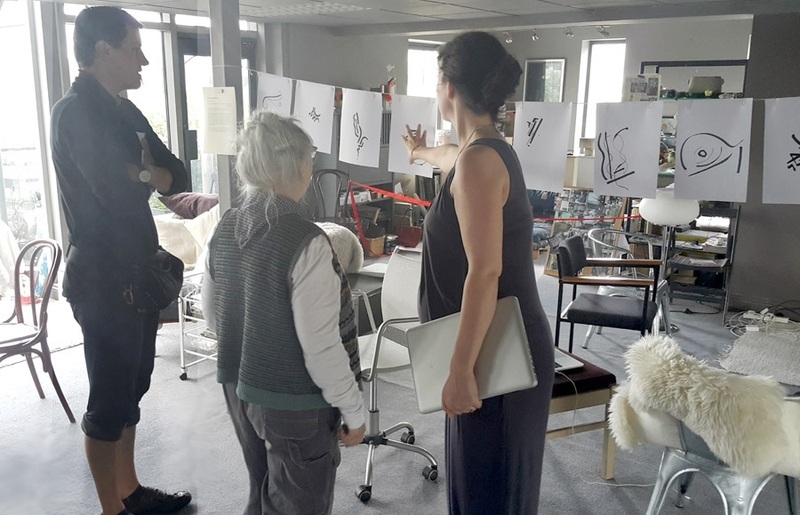 The performance piece Communal Calligraphy took place on 10th June 2017, during the “Fringe Arts Bath Festival” in Bath, UK, as part of an exhibition/event entitled “On the tip of my tongue”, curated by Alice Ling and Bryony Tilsley at the home of a local resident, Chrissy Philp. The exhibition of sound, multimedia and performance work, aimed to consider “the conversations we struggle to have [and] the things we never say”, in a residential setting. 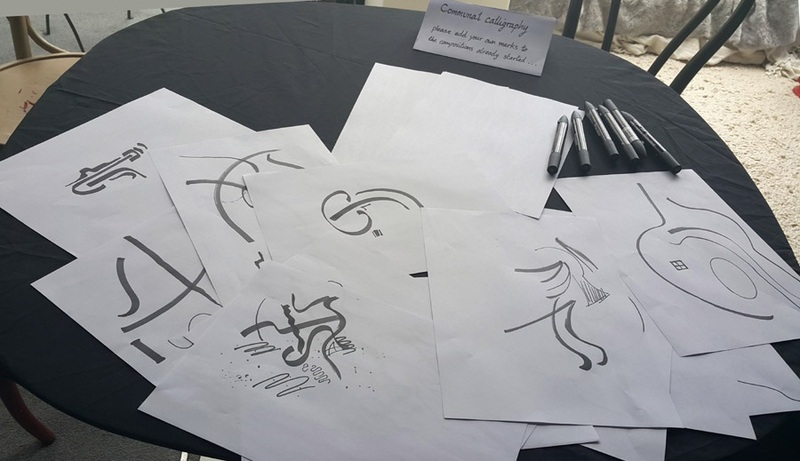 Communal Calligraphy aimed to explore what can and cannot be put into words, and the communicative potential of written marks in social contexts. 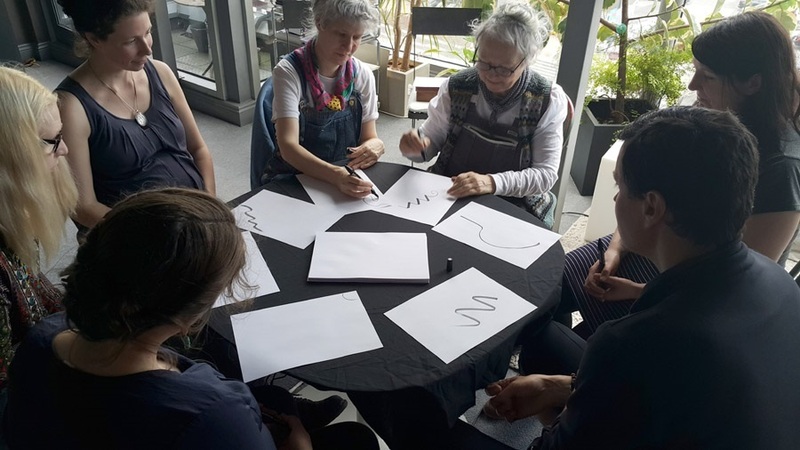 During the performance, seven invited participants sat at a circular table making single marks on sheets of white paper with black marker pens (fig. 1). The paper was then passed to the next person in a clockwise direction. The next participant then made another mark, interpreting, responding to, and developing the first. The paper was then passed again until a full circuit had been made. Participants were free to make whatever mark they thought appropriate and challenge or elaborate upon previous marks as they wished. After approximately 1.5 hours the performance ended. The word-compositions that were produced were displayed at the exhibition venue and subsequent visitors encouraged to make further marks as they saw fit (fig.2). 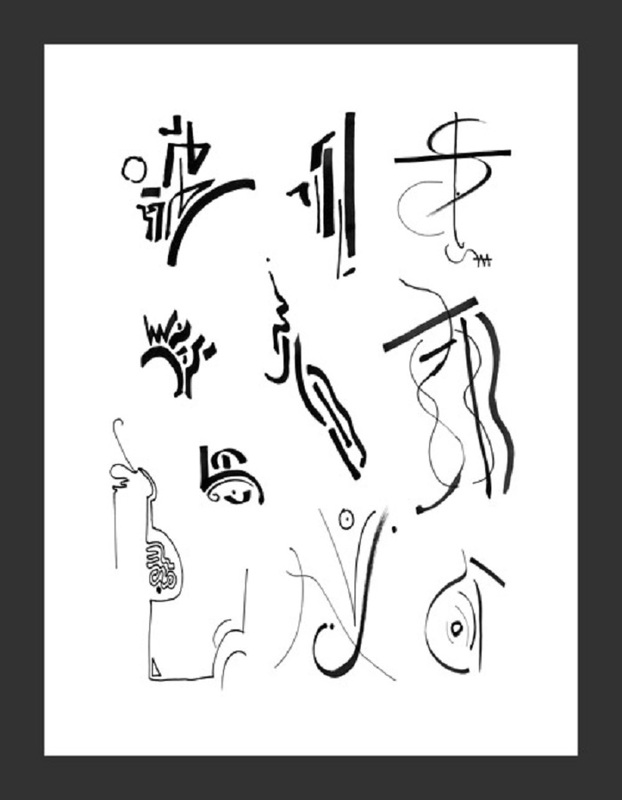 Once the exhibition had finished the word-compositions were discussed, selected and digitally scanned (fig.3, fig. 4). A Photoshop file was then composed of the various compositions—each as a different layer. This was then made available on the internet for the original participants to edit. Fig. 5 (at the top of the page) shows the final text/composition.